“Whether I was the first or the last on the list of results is not important. What matters is not to give up in face of difficulties and reach the finishing line” – said Lipińska, whose result was 3:15.14. Considered to be the best long-distance runner of the young generation 26-years-old Jastrzębski took the lead right at the start of the race and hasn’t lost it once, winning with a result of 1:06.11. For 21 km he followed the pilot car by himself, leaving his competitors far behind. The achieved result is his life record, which … he is unimpressed by. “I could have done better, but maybe I started a bit too fast. It cost me quite a bit – I suffered for the last 6 km, but I managed to finish the race, win, and… I’ll surely come back, since the atmosphere of both this quick route and the runners` park is amazing” – he said. Anna Łapińska (KS Warszawianka) was the fastest of women – 01:16.10. As she admitted, the beginning of the race did not bode so well. “The first 10 km were hard, but then… Then I don’t know what changed, something suddenly launched and my legs started speeding towards the finish. I overtook Dominika Stelmach, then one guy, then another, and that’s when I knew I wasn’t giving up women’s best score to anyone” – she said. However, the true winner is everyone who, on the quick route through the main arteries of Praga Południe, achieved a satisfactory for them score. “For nearly an hour of giving out medals to the finishers I observed how happy the runners were about their results and achieved life records. What professional athletes feel is available for any enthusiast of running” – summed up Jacek Wszoła, Polish high jump Olympic champion. “Everyone knows that the route of the Praski Half Marathon is quick and its date ideal, but after this edition, amazing experiences provided by the organisers need to be added to that list. Lights, music, torches welcoming everyone at the finishing line – simply awesome” – he said. The main race was finished by 6714 participants, 1758 of whom are women. 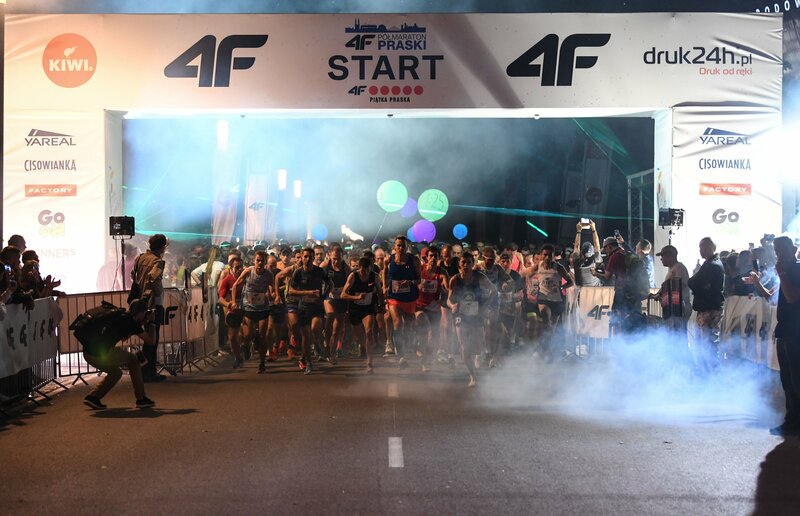 Another 2528 reached the finishing line of 4F Praska Five – a 5 km race accompanying the half marathon. The best result was achieved by Henryk Szost, Polish marathon record holder, who arrived at the finishing line right next to Artur Kozłowski. “After marathon competition in the European Championship, this race was supposed to be +fun run+, but… it turned out differently. Great route and good atmosphere made it difficult to hold back and run calmly. The adrenaline carried us forward, we entered quite a healthy competition there” – said Kozłowski. The best among women participating in the 5 km race was repeated champion of Polish stadium and street runs, Ewa Jagielska, who achieved result of 16.16.